(VIENNA, VA, September 10, 2015)—1105 Media, Inc. is excited to announce the launch of ACQUIRE, a two-day educational conference and tradeshow for government acquisition and management professionals. ACQUIRE's mission is to help government agencies create, manage and run successful programs. ACQUIRE, produced by the same teams behind the FCW, GCN, Washington Technology, Defense Systems and Federal Soup media brands, will take place June 8-9 at the Walter E. Washington Convention Center in Washington, D.C. The show will provide multiple agencies an opportunity to engage federal and military personnel with education and training opportunities across three key OMB spending categories: Professional Services, Office Management and Information Technology. "1105 understands that the government has a renewed focus on smarter acquisition processes, and we are building a show to meet that focus head-on," said Carmel McDonagh, Chief Marketing Officer of 1105 Public Sector Media Group. "Our goal is to equip government personnel with the skills and training needed to enable efficient and effective decision making throughout the program lifecycle. ACQUIRE will make the agency workforce smarter." Thousands of government professionals from all stages of the program lifecycle will attend the event: policy makers, strategists, managers, decision makers and end users who are responsible for setting policies, defining requirements, acquiring products and services, implementing and managing programs and delivering the end-user experience. ACQUIRE will feature multiple training courses from a diverse range of government agencies, a variety of informative breakout sessions, visionary keynotes, an exhibit hall packed with vendors from three OMB categories (Professional Services, Office Management and Information Technology), educational clinics on the show floor, book signings and much more. ACQUIRE will also feature the Happy Fed pavilion that is dedicated to helping federal employees achieve a balanced, fulfilled and happy work life. "As tools, techniques and strategies for the acquisition and management of government programs are constantly evolving, government agencies are actively seeking new products and services to meet the demand of their programs," said Henry Allain, Chief Operating Officer of 1105 Media. "1105 recognized a need in the market for a show that brings together all stakeholders in the program lifecycle." 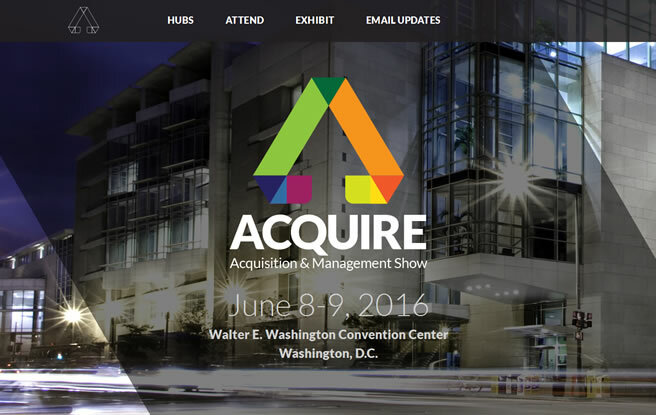 Sponsorships and booth sales for ACQUIRE are now available, and attendee registration will open in January 2016. Please visit: https://ACQUIREshow.com.